I think I have owned up to the fact that I was never a huge Lynyrd Skynyrd fan, particularly, during the heyday of the band. I always thought Freebird sort of silly and overindulgent, and the band did pretty much seem like a street fight version of the Allman Brothers, and I remember being in London, at my cousins Jim and Evie’s, when the news of the 1977 plane crash that killed Ronnie Van Zandt. 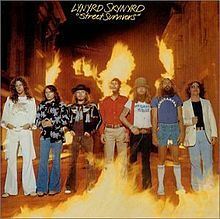 That was on the heels of the release of the album Street Survivors which featured the band prophetically with a wall of flames behind them, and the truth is my first thoughts were about the power of karma. Well, except that I did indeed find the song What’s Your Name? was a pretty funny and well executed pop song. And, over the years, as with bands like Rush, and even the Zep, whom I was cooler on for years than the band deserved, I have come to appreciate the Skynyrds as a pretty good and fun band with some good chops and clever words. But, over the last month, the SONY TV HD Channel–one of several million it seems on my remote–a lot of documentaries about music and bands have been showing. There was one on the Allmans, and a pretty fun one on wierd Christmas songs that featured a lot of time with Dr. Demento, among others. But, for some reason I taped Gone With the Wind: The Remarkable Rise and Tragic Fall of Lynyrd Skynyrd, which clocks in at almost three hours, believe it or not. And, the film was more than engaging, highlighting not just the band, but in particular the driven Ronnie Van Zandt, the brains and driving force behind the group, who it seems was hardly a thug. In fact, Van Zandt seemed to have been disciplined and focused beyond all belief, as the film reveals. He learned to be a pretty good singer, and truly was a solid enough songwriter, and, well, if nothing else, his band was a lot of fun. They were also a monster triple guitar attack band, although it seems improvising was not within the realm of the group. I do recommend the film though: interesting, engaging, and well fun watching a lot of stoners reminisce. For a sample, how out Mr. Saturday Night Special. Tell, me though: is it pro gun, or anti? Van Zandt was fabulous at these vagaries. This entry was posted in lawr, Lunch Break, Movies. Bookmark the permalink.